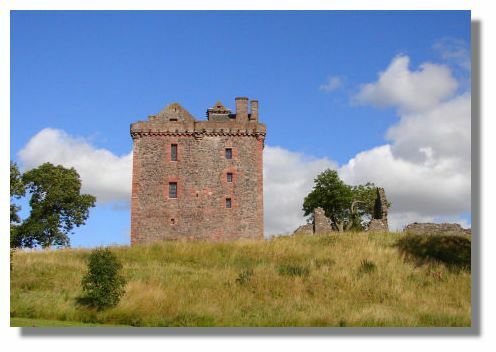 Balvaird is a large L-plan, fortified tower house, standing on a south-facing hill looking towards the Lomond Hills. The A912 main road now passes by below, heading towards Glen Farg and then Bridge of Earn, four miles to the north. It is a couple of miles north of the A91 road from Kinross to St Andrews (on the way to Falkland Palace and Auchtermuchty). See Location Map. The name "Balvaird" is Celtic, signifying "The town of the Bard." 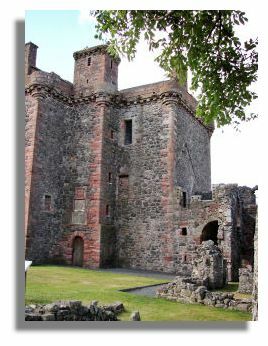 The estate was owned by the Barclay family but the present tower house is thought to have been built by Sir Andrew Murray, a younger son of the Murray family of Tullibardine. He had married the Barclay heiress, Margaret in the late 15th century. Their arms and the date 1567 used to be seen over the gateway of a later courtyard when it was constructed at that time. There are traces of ramparts further down the hill which were probably built as part of an earlier structure by the Barclays. The large tower measures nearly 150 feet long by 100 feet wide from which a large wing projects. There were lower buildings all round a central, defensive courtyard (known as a barmkin). There were also extensive walled gardens within that area. To the north-east was an orchard area, known as a "pleasance". Not much remains of the out-buildings, but the main building has been re-roofed to preserve the structure. The Rev. Andrew Murray succeeded to Balvaird in 1631 and ten years later King Charles I elevated him to the title of Lord Balvaird. That was apparently done as much to annoy the Covenanters (with whom Andrew was unpopular) as to honour the recipient. The Lords Balvaird stayed at the castle until they inherited the Earldom of Mansfield. In 1658 they moved to the more comfortable and grand Scone Palace - which came with that title. Balvaird is now administered on behalf of the nation by Historic Scotland (although technically still in the ownership of the Earl of Mansfield). The castle is accessible from the outside throughout the year up a steep path from the car park below, (perfectly adequate for some great photos), but entry inside is restricted to weekends in the summer months. 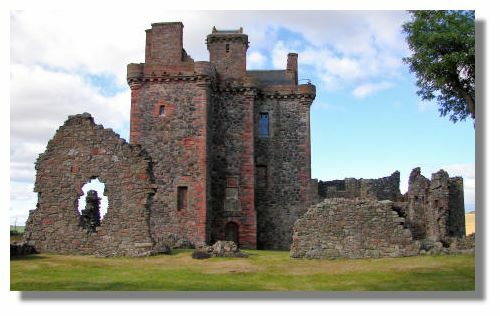 or go to the next castle: Balwearie Castle.